The new electronic Fire Danger Rating Sign near Lions Park. 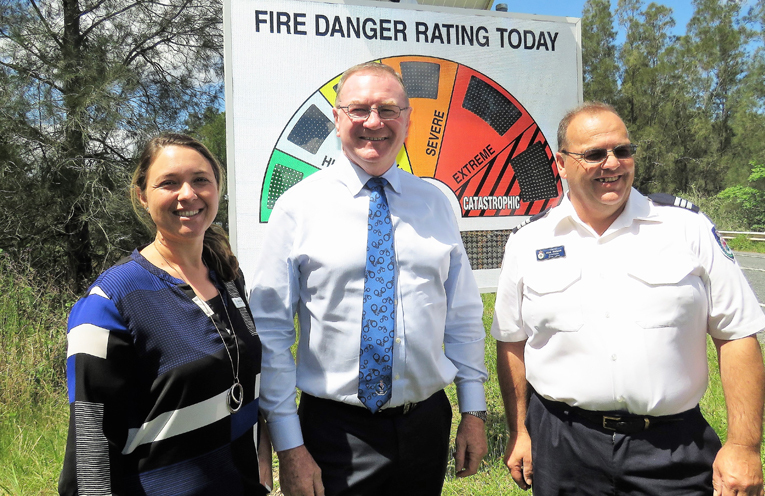 AN electronic Fire Danger Rating Sign has been installed along Bulahdelah Way with the aim of boosting bushfire safety and awareness in the community. 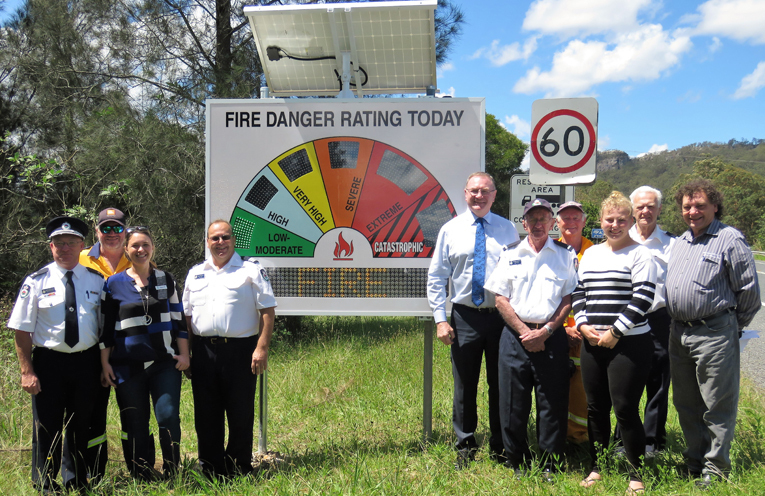 The new solar powered sign is a first for the region and features automated indicators and an LED message panel to display bushfire and emergency incident information. The sign is updated every 20 minutes from the Rural Fire Service (RFS) server making it easy for motorists to see the current fire risk. 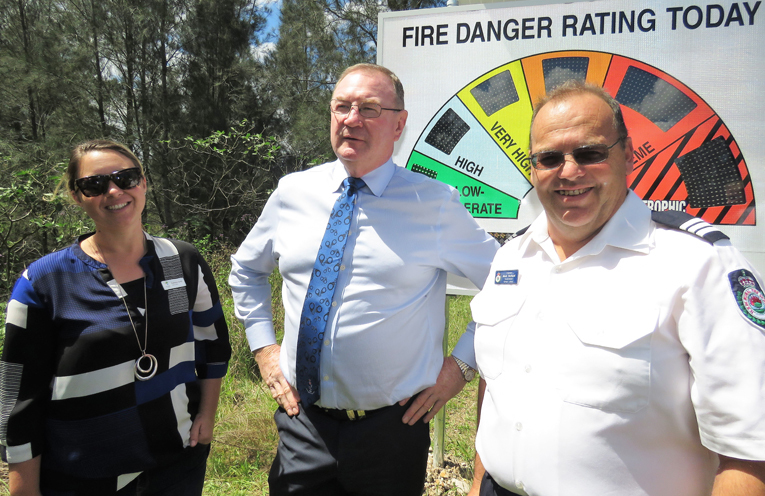 “The advantage of the electronic sign is that it can be changed quickly so everyone can get reliable and up-to-date information,” Bulahdelah Rural Fire Brigade secretary Grahame Rowell said. The local brigade, with support from the Lions Club, Chamber of Commerce and MidCoast RFS, secured a $20,000 grant for the sign through the NSW Government’s Community Building Partnership Program. “The sign is innovative, it stands out and is the only one of its kind in the MidCoast Council area,” Myall Lakes MP Stephen Bromhead said. The new sign was recently installed roadside near Lions Park and was officially launched by Mr Bromhead last week. Deputy Mayor Katheryn Smith, MidCoast RFS Superintendent Kam Baker, Bulahdelah Brigade Captain Mark Hartwell and local brigade members Scott Bidwell, Kevin Johnson, Grahame Rowell, Laurence Sumner and Meagan Terry attended the ceremony. “The RFS guys do a fantastic job with constant call-outs to fires and motor vehicle accidents and this sign is another thing that can help them,” Mr Bromhead said. Electronic signs are now starting to be rolled out in high risk areas across NSW to replace the manually-set fire rating signs. 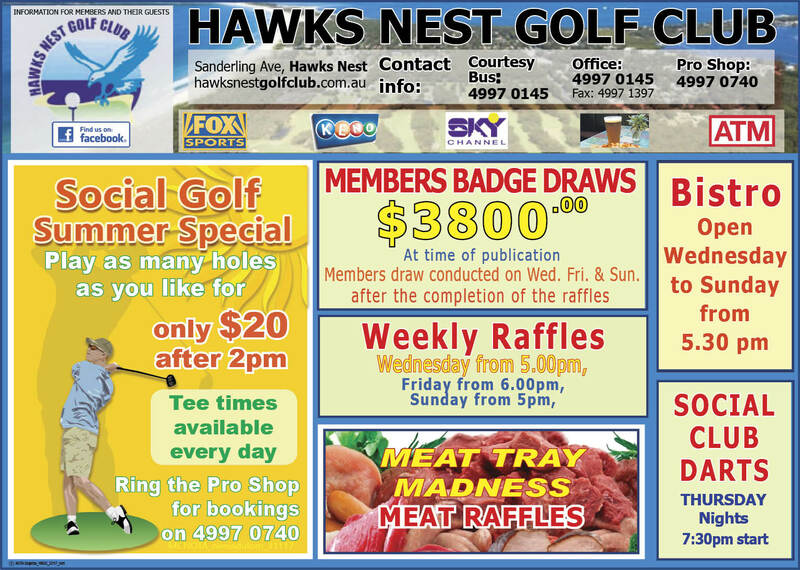 Mr Bromhead said the new automated sign in Bulahdelah is the second to be installed in northern NSW. MidCoast Deputy Mayor Katheryn Smith, Myall Lakes MP Stephen Bromhead and Bulahdelah RFS Captain Mark Hartwell.